You all know that I adore Matt Betts. We scuffle, fight, stomp around, take scowling swipes at each other, and neither of us have even made it into the HWA yet. Which cracks me up, but seriously. I’m so going to beat him one day. Really. But besides just being loads of growly fun, Matt is an awesome writer. Witty and funny is difficult to pull off, especially when it comes to poetry, but Matt manages to do it with ease. 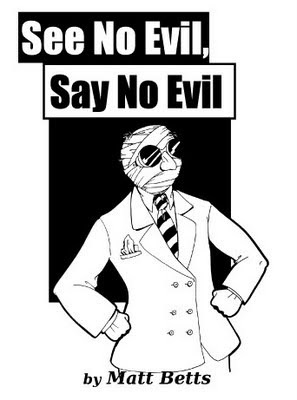 His new chapbook of poetry is titled See No Evil, Say No Evil. It’s a delightful little book crammed full of his work and some pretty spiffy drawings by Rebecca Whitaker. It’s packed full of Matt’s signature humor that suddenly dives into something poignant and fairly painful. Whether he’s touching on sharks (“Everybody Out of the Water”), Elvis (“Elvis and Gretel in the Woods beyond the Railroad Tracks”), or villainy (“Side Effects May Include Itching and Super-Villainy” and my favorite poem of all, “My Bad”), I can promise you that it’ll be a completely unique take on familiar characters. It’s worth buying the entire collection just to read “The Night Godzilla Dumped his Chick”. Relationships are tough…and tougher still when your love is cheating on you with the entire city of Tokyo. I nearly snorted Coke Zero out of my nose half a dozen times while I read this, and ended up reading most of the book to my husband. But it isn’t all laughs. The giggling stops abruptly sometimes when Matt zeroes in on something particularly bruised or lonely. Making you laugh and then poking at universal wounds? That’s playing dirty. But it’s very, very cool. I think I must procure a copy of this thing of which you speak…. See? It’s stuff like this that’s going to make me feel really bad (for a minute) when I finally, eventually, someday get around to defeating you in the HWA Challenge. Thanks so much for the kind words! I’m really happy you enjoyed it!